WELCOME TO THE “KARBI” BLOG! Mental Illness and Social Response— A Karbi perspective. Total Karbi population in Karbi Anglong District : 353, 513 ( 2001 Census). However the actual population figure of the tribe for the whole of NE of India is more than 800, 000. Racially the Karbis belong to the Mongoloid group and linguistically they belong to the Tibeto-Burman group. The original home of the various people speaking Tibeto-Burman languages was in western China near the Yang-Tee-Kiang and the Howang-ho rivers and from these places they went down the courses of the Brahmaputra, the Chindwin and the Irrawaddy and entered India and Burma. The Kabis, alongwith others entered Assam from Central Asia in one of the waves of migration. The folk-lores of the Karbis, however, indicate that during the long past, once they used to live on the banks of the rivers the Kalang and the Kapili and the entire Kajiranga area, the famous National Park situated in Assam, was within their habitation. During the reigns of the Kachari kings, they were driven to the hills and some of them entered into Jaintia hills, the erstwhile Jaintia kingdom and lived under the Jaintia suzerainty. While a section of the Karbis remained in the Jaintia kingdom, others moved towards north-east by crossing the river Barapani, a tributory of the Kapili and entered into the Rongkhang Ranges. There they established their capital at a place called SOCHENG. The Karbis who migrated to the Ahom kingdom had to face the Burmese invasion. The Burmese who invaded Assam perpetrated inhumane oppression on the people. The Karbis took refuge in the deep jungles and high hills leaving their hearth and home in the submountane regions. In order to save themselves from the greedy eyes of the Burmese invaders, the young Karbi girls started to use a black line from the forehead to the chin which is known a “DUK” with a view to making them ugly looking. While some of the Karbis migrated to lower Assam, some had crossed the Brahmaputra and settled in the north bank. The Karbis have 5(five) clans called “KUR”. These are Terang, Teron, Enghee. Ingti and Timung. Each of the five clans has a number of Sub-clans. While Enghee and Timung have 30(thirty) sub-clans each, Terang have 15(fifteen) sub clans, Teron have 9(Nine) sub-clans , and the remaining clan Ingti has only 6(Six) sub-clans. These clans are completely exagamous and marriage between a boy and a girl belonging to the same clan can never take place since the children of the same clan are considered as brothers and sisters. Violation of this customary law obviously leads to ex-communication of the couple involved. Even in the cremation ground called Tipit or Thiri, area is kept demarcated for each clan. Although all the five clans are socially on an equality, Ingti being a priestly clan was supposed to have a higher status in former times. Although, monogamy is the prevailing practice, there is no bar to polygamy and the cases of polygamy are very rare. Cross-cousin marriage is a preferential one. Like other tribal societies, the Karbis do not have the system of bride price. After marriage, the wife continues to use the surname of her father. But the children assume the title of their father. Thus, the Karbis follow the patriarchel system of family structure. The settlement pattern of the Karbis is in the form of a village. Each village has a headman called Gaonbura or Sarthe who is appointed by the authority of Karbi Anglong Autonomous Council. But each revenue village has a number of hamlets situated kilometers apart. Each of the such hamlets has also a Gaonbura. 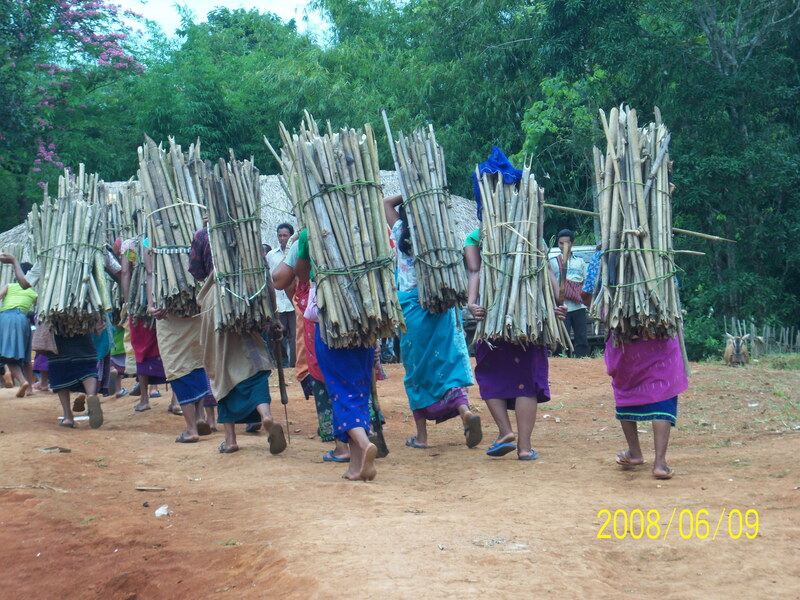 Each Karbi village is named after the Gaonbura. The Karbis, like the other hill tribes, have a tendency to live on the hill tops. The Karbis who practice jhuming or shifting cultivation very often shift their villages to new jhum sites which might be 10 to 20 kms away from the present site. Among the festivals observed by the Karbis, mention may be made of the “Chojun Puja” or “Swarak Puja” ;”Rongker”; “Sok-keroi”; “Hacha-Kekan”, “Chomangkan” , etc. While the former four festivals are socio-religious in nasture and the letter is a social one. The spot for “Chojun Puja” or “Swarak Puja” is generally selected near the house of the family which wishes to perform the puja. The deities in this festival are Barithe, Shar Arnam, Arni and the Devil Hii-i and other smaller Gods. Hemphu, the greatest God of the Karbis is also propriated.The puja is peformed for the welfare of the family. The Karbis have their traditional dresses which are artistically designed. These dresses are woven at their family looms.There are separate dresses for men and women. The aged men use an artistically designed shirt called Choy-nangpo and the shirt used by the young men is called Choy-hongthor. The men use a loin cloth called Rikong. Those Karbis residing in the plains of Kamrup and Morigaon district of Assam, and the Ri-Bhoi districts of Meghalaya identify themselves as the Dumrali or plains Karbis. With their social head at Dimoria, culturally and customarily they have different sets of social behavior and functions to their counterpart at Karbi Anglong. Linguistically they are a sub group of Mikir groups of the greater Tibeto-Burman family and class as Amri (the other being Karbi) in the latest grouping of the T-B family. The field work was undertaken at Mermain (aka. Marmé) (26º E and 90° N); a village at the border of Meghalaya and Assam. The village is divided between these two states as half the village is in the other side of the political boundary. 40 % of the population in Ri-Bhoi district of Meghalaya consists of Karbis, amongst whom about 60 % profess their religion to be Christianity, and the rest are of traditional religion. You will come across some unfamiliar clans among the populaces like Klien, which is claimed to be the another version of Killing, a sub clan of Tungjang (Timung), and Rongson or Rongchon, which is not different from Ronchehon , a sub clan of Ejang (Ronghang) as claimed by the local population besides Longthulu, Tron and Tumung. It is celebrated in the months of March-April. It is a festival of thanks giving to the almighty Hemphu, the traditional god head of the Karbi Household. Each member of the social setup of the village is known as MEKAR, which might be the origin of the word MIKIR as the tribes were known till very recently and in fact still do in some of the official documents. However this is just a hypothesis I would like to go more deeply into. During the festival all the ancestors of the village are remembered and worshipped, which is indeed very similar to the practice of their hills cousin. This practice is known as SAR-KACHERDUNG. “lit. ANCESTOR REMEMBER” the same as SAR ANTHOK among the Hill Karbis. Literally Mono means Paddy or Rice and Ke-en means to take. It is generally an affair of 2 days, once in five years. All unmarried males and females of the village are to take part in the occasions. In the house of Riso Bangthe (an authority concern with the affairs of the youth of the village) the traditional folklore about the origin of rice and the route of migration taken by the Karbis from the place of their origin are retold. It is very much the same story which is told amongst the Hills Karbis (Mosera-Kihir) but with the name ‘Karbi Kevang’ “ lit. Karbi Coming” with some addition like the reason for the Karbis to start moving out from their ancestral village somewhere near Inglong Kelok “ lit. Mountain White” , which is unmistakably the Himalaya mountain range. There is a mentioned of Lhasa also on the way. The mentioning of KLENG MEKAR, on whose head a flame of fire always glow to lead the Karbis during darkness is intriguingly interesting and to be noted. He is not mention anywhere in Mosera-Kihir, the hill version. Terang were supposed to be the porter who carried all the essential items needed for the whole village. The reason mentioned for the Karbis to move out of the ancestral village is also very interesting. It is said that the Karbis being very poetic and romantic once tried to touch the moon and play with it, seeing it stationed beautifully on the top of the INGLONG KELOK. But when they climbed up to the top of the mountain and found the moon to be still afar and unreachable, then only did they realized their mistake. Since they felt ashamed to return to their ancestral village they decided to move forward towards the east and settled down somewhere else, which is not found in MOSERA-KIHIR. The mention of the river TERON LONGSO, where the TERON with divine power helped the others to cross a river with huge width by stretching himself like a bridge is also very interesting, which has again no mention in Mosera-Kihir with the exception of the river TERON LONGSO, where the paddy was supposed to be discovered by the Karbis which coincide very much with the version of the hills Karbis. Literally Rong Kehum means Village Curfew. It is generally a three days affair once in five years. Just like the name suggested a kind of curfew is imposed in the village with all the roads leading to the village being blocked with thorn and bushes. No outsider is welcome to the village during these three days affair. However they can come and witness the ritual by taking non traditional route. This festival is generally celebrated during the winter. It is very much similar to the Rongker of the hills Karbis. This is all male affairs and no female is allowed during the rituals. The fences are broken and lots of hue and cry is created during the rituals as a symbol to chase away evils from the village during the night using a long stick. If any person comes out of the house during the ritual then he might be killed assuming to be an evil spirits and no blame is to be confer upon the evil spirits chasers. Administratively the Plain Karbis are divided into 9 political areas. With its social head at Dimoria it is divided into 5 Richo (kingships) and 4 Bangthe (a kind of President ship). The Five Richo are Borkuchi, Tentala, Tikra, Bura and Nortap where as the 4 Bangthe are Marme or Mermain, Somra or Silimor, Honai-Raika and Killing ( Killing Nongkret is the area where the legendry Tiger men existed) . Huria: He is an assistant Judge. Enghi Clans is associated with this post. Karkun: A Clan of Ramde, a sub clan of Ejang again is entrusted with this job. Karkun is a fine collector and a butcher for the social event where animal sacrifice is to be made. Bisar: He is the supreme Judge for any kind of conflicts and issues. Ingty Clans is entrusted with this job. Klengsar : He is the decision maker among them all. It is he who is to convey the decision taken to Rongchon. He acts something like the prime minister. Riso-Bangthe : He is to look into the welfare of the youth of the village, and the affairs related to the education of traditional knowledge to the young. He is from the Rongchon Clans. Kathar: He is the Head priest of the village. All kind of sanctification and purification is to be undertaken under his keen eyes. He is in-charge of the religious affair of the village. Ingty clans are entrusted with this job. Barika : He is the main Messenger and announcer in the village. He is from Enghi Clans. Special thanks to Mr. Philippe Ramirez for organizing the field trips and guidance. Also to Mr. Dharam Sing Teron, Ex MLA, KAAC ( Karbi Anglong Autonomous Council) for his ample guidance and support . A gratitude to Mr. Owen Terang, President, AMKA ( All Meghalaya Karbi Association) for hosting us and providing us with all the information and for organizing a meeting with the elders of the village during our visit to Merme. What u r thinking is unthinkable,what u r doing is ultroneous job and what u r presenting is unprecedented, a historic evengel for Karbi history. Your effort in making the Karbi website is truly praiseworthy. I on behalf of ‘All Meghalaya Karbi Association’ (AMKA) appriciates for your hard working for comprehensive iformation about the Karbis. great work and very useful information. Must read stuff for all karbis. Thank you. You have done an essencial job for the Karbi community. keep it up. I convey my sincere gratitude for your job. Dear Morning kee! thanks for your efforts for extracting the what is what of the Karbi people leaving both in hills and plains of the N E Indian States.Go ahead.I encourage you to get more deeper into the karbi society. I assure you to extend all possible help in this field. dear thanks for your efforts for extracting what is what of the karbi people leaving both in hills n plain of the n.e Indian states. Aprang si Nelining aklong pen nangliphan kardom nangpajir ik lo Kardom. Lapen nangliphan choro re un eh nangli khai phan la an chepaduk pen kam keklem pon ajoine. karbi ta khei kangthim pu bang aso tum ta dak pen chini pame po. ‘dear pancho bro/sis whatever’ you are really doing a great job. Dear bro/sis i want 2 know more deeply…. Abot kARBI’s…!! Spclly abot the clan (bey)…… Their position, duties, which clan r relatively brother’s & sistr’s, girl friend blah,blah,blah…. Me ‘sony’ from khepeni-jal, lakhra, guwahati… (Likhna jarur my dear bro/sis whatever) Thank you. THIS IS REALLY A GREAT JOB DONE EXCLUSIVELY BY YOU TO BRING OUT THE UNEXPOSED PART OF THE HISTORY OF THE KARBIS. SO, A BIG THANKS TO YOU. This is truly an appreciating job. I have read your article thoroughly and indeed I enjoyed it. Writing a historical background about the tribes whose original have not been discerned in the correct form according to classification and analysis made by the anthropologist due to the lack of an authentic facts to be presented by the history is quite a difficult job. But through your article you have let us know our historical background which is in fact still unknown to some people. eg. Some Karbis in Ri Bhoi dstrct of meghalaya claimed themself as khasi. Am going to write the story of Karbi’s, i need your help because to have a good information, i hope that this place help me what am going to write….thanx…. i hav to thank u a milion times.before reading ur article i had little knowledge ,now i can say i know many things of wat i belong to.thank u so much…..
Nangli Chinese scholar alam kepaklang konat a-source (blog/web address) penma lahei pakalngthek asonte meparji. Nanhli kachini alam karbi.wordress kelang atum an ta anke chinilong pame po. Kardom!! first of all am very thankful to you ,i really appreciate your effort for karbi community and for the new generation,your contribution help us to preserve our karbi harmony alive.its help to our new generation to know about their history and identity. All the information is very useful, it will help the learners to know more about the Karbi tribes, I appreciate for using your valuable time to provide such information for the community. All the informations that I found here are really helpful for me,from here only i came to know the Karbis living in N.E Areas. I really appreciate your hard working to make these valuable information. May God bless you and Our prayer is always with you. the information you presented here indeed helpful for me and an eye opener for me to know more details about karbis. hope this will inspire the younger generation, also help them know more about your tribe. great to know all this information’s. isi alam kachiniji do lang. Ente la karbi atribe ke kopi atribe pen si kevanglo. At first I will be say to Thanks you. I proud of you, I read ur articles and I get more knowledge about our tribe. I really appreciate your hard working to make these valuable information. May god blesse you and our prayes always with you. Can you please clarify how some BANGTHEs are directly under Dumura Recho (Sar Recho). If I am not wrong, Sar Recho himself centrally administered the area from somewhere Topatuli (near Jagiroad) to bordering to Rong Tintili ( Tentela) in the west. Rest all area were administered through his subordinate state RECHOs like Tentela, Tikra, Bursi,Nartap, Kuwanchi etc. In the state where there is no RECHO was administered by PENPO, not BANGTHE. The council of such nine RECHOs/PENPOs was clled “ASON SIRKEP”. The ReCHOs/PENPOs have subordinate thirty village heads called BANGTHEs. The council for the BANGTHEs was called “ASON THOMKEP”. its really useful information not only for the karbi people its also a very important information for the people of Assam. we as a people of Assam we all should know it.Many many thank to Phangcho. Fist of all I would like to apreciate you for the excellent work. More comprehensive study is required. We expect about Kabri People living in Arunacahal, Bangladesh, Thailand………….. from you. Carry on. kARBI ACHITHE PADING NANG!!!!!!! Lot of appreciations for your work Mr. Phangcho. But I don’t understand why you have mentioned that Karbis live in the plains in Kamrup and Morigaon districts of Assam only. Because a large population of the Karbi community dwells in many other plain distts. of Assam like- Nagaon, Sonitpur, Lakhimpur, Golaghat etc. We are expecting more information, specially about the ones that settled in the north bank of Brahmaputra. To Karbi Akei aphanta a than pon lonang…. chinghon Khei aphan lapen cherap cheto lonang. Karbi akhei kahache cheng adim ke Man-tai atum tarlip pen paklang ke “phek” pu along adim henlo pusi pulo lapen phek puke Karbi atum arnam amen peng pu pensi keman pusi Man-tai akhei atum paklang bangso aputhak Assam man-tai akhei atum tarlip alongsi jongponlo.bonta Karbi atum amethang Kachipuke Socheng henlo pu.neli kiri tarlip pen angthek kelong ke Karbi akhei kiphi keplang cheng adim ke LHASA henlo.Lhasa ke karbi atum monit apun keman cheng adim lo lapen Karbi akhei along pinso pen arloso kache an chedo cheng adimlo.lapen Karbi kithi cheng adimlo.Birsing bi-lijang,ser-li et,Miring rang atum alanglitum ajirpo kithi ahut Mir epu pen chepadi dun ji pu mir kiri dam ahut saideri pu abangphusi Birsing bilijang lapen ser li-et atum aphan Kave ason athe pi dunlo.pen bangso akove ason athe Chodet aphisi Bir sing bi-lijang lapen ser-li et atum che an chedo asai klem phitlo pen alanglitum arleng kithi ahongklang along lapuson asai kachomatha aputhak thangta chi chine pusi chikobir lo pen Mononphi monit arleng kithi ahut lapuson asai akam alar ke alam anle chethan chot lo nang pusi pulo.Lhaso amei along klang tangdet akam monongphi ke akam pen mute alam le paman chot nang pusi Birsing bi-lijang chekobir ahut ningje.lasi aphi aphi ke monit kithi arong kethon amei aphan ke Lhasa amei pusi pulo.lapen Lhasa amei along kache an chedo alar alam Risomar-okarjang atum chepa-er si chepa -er chotlo lasi nonputa chomkan ahutke Lhasa kekan pusi pulo. Lhasa puke karbi akhei monit apun keman adim lapen Karbi aphurkimo kecheng atiri adimlo. Khei pangtang ji pulote aprangsi :- 1. Elitum Karbi do an isi vet do thek nagji chinghon thek nangji cherap nangji, 2. hamphang (org.) do an karbi arat aso aphan rai thek nangji. 3. Toklang (education) hin mevik nang silang Karbi Anglong athe “Education is the Backbone of the Society” arnam etum phan kelang ji aphan amek (eyes) nang pilo sita eliyum toklang(education) le thekthe pulote ilitum non apirthe ke ajat ta chechar dundelo. So, Education is a must to all the Karbis in any cost. I am working of Oral mythic history of origin of Autochthonous Mongoloids. Can you tell us the Neolithic oral/mythic history of origin of Karbi or Mikir? J.R.Subba, Ph No 8348164540 E-Mail:jrsubba@gmail.com from Sikkim. Ne wrong ke dokmoka karbi anglong kat tisso baghpani ne ka porhi ke 1st yrs diphu govt collage ne tum korte bang phli do engjir bang hini ne ke 3nmbr abng lo neli arta ke 18 yrs wet lang. Ne li non ne piso aphan chngki bm k dilai 10mile ne tum k pinan so aten lo la phan ke enpik anlo la phan ke ma jok le chngki c ta me la ke 2nd hend lo la phan k chngki ta le awe lo amen k klar-et engty taropi ka porhi ke clz 10 lo …..
karbis are beautiful people and I strong believe that karbis are originally from Lasha. it also belived that many years ago they also live in the river in china.But still nobody clearly defined the exact history of karbis because of their unstable nature might be.. I still have many confusion about the original place. I heard many history of karbis and I believe too but have many doubt abt truth.. please anyone can clear my doubt? I would like to know more and more information about the sources of the Karbis Tribe, because it is one of the unique tribe which had created by God’s……… so kindly give the more more information who known well about that……. expant from Lasha to burma..north- eastern region.but affer india got post history Mikir was Establish Kingdom at socheng of( mahabharat) srikrishna erra. Neli hin pen aprangsi nagliphan chorolo. Lapen neli chini ingtuk duk,Thong nokbe,Rongpharpi rongbe,kajir Ronghangpi. alangli tum akai alamet nangli than pachini ik tha. Akehai Phangcho lapen Hanse asangho nanglitum banghini alam ta ahok sitame kolo abangsi ahok.? Eli so karbi aso atum ke kethek kere atum pusitame, kethek aan kachini aan ason sitame aso asu aphan ta chethan at kartang pu, amat kachethan tekang pabeng chot-chot amat pene- pena a arme ason nang jut bom lo.kacho karkli kachophijo punon,lun,lam,tomo punon sab nangjut bom lo.lasi neli hin pen nangli tum akesar atum aphan lapen ketok kelang atum aphan puthot choningri lo, je kaduk kave alam pangrum ra ingsai pame ra ahok pet pen karbi alun,temo akhai paplang pon ik tha.akehai M Phangcho asangho nangli chepaduk lo,sitame aan sose chepaduk pon ra,socheng lapen lhasa la long hini adim ta papho ponra puthot karbi history along pachini pon thu ik ji aphan choningri lo.karbi akhai ke khai kang thim pu,pora pachi than nang. mo longle kangtang pirthe kangtang aan ta. INDIGENOUS Karbi PEOPLE HAVE THE RIGHTs of their Foundamental rights of all with Dignity & Equality. Kardom phangcho akehai…etum karbi tum ta karbi history chepaklang dun nang. . .omg ye mera india along. Thank you…,Mr. M phangcho sir,our historical sameone to know about your exhibitions. Can someone please tell me if karbi has subtribes? If yes,what are they? Urgently in need of answer by 1st February. Got a project to complete. Chorolo akehai nangli keklem chepaduk pen lason ilitum aphan klardak pen pachini pon thek apot nangli long Arnam a hirjume pado nang. Interesting article…..I would like to thank article writer….